The chocolate has good depth of flavour but is not overwhelming; the chocolate chips provide nice toothsome texture, when fully cooled, or a burst of molten chocolate when just out of the oven, contrasting with the decidedly moist brownie. It is predictably sweet, as one might deduce, from the proportions. I wonder about adding some espresso powder to enhance the depth of flavour, but I have yet to try that variation, which would be a departure from the original. 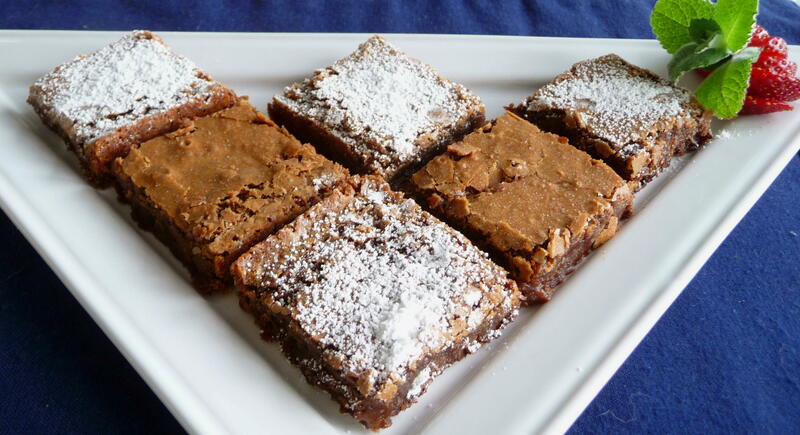 This recipe is similar in proportions to Katherine Hepburn’s Brownies, which I had made out of Dorie Greenspan’s Baking: From My Home to Yours. Although the flour in Jessie’s is double that of the latter recipe’s, the textures were pretty close. 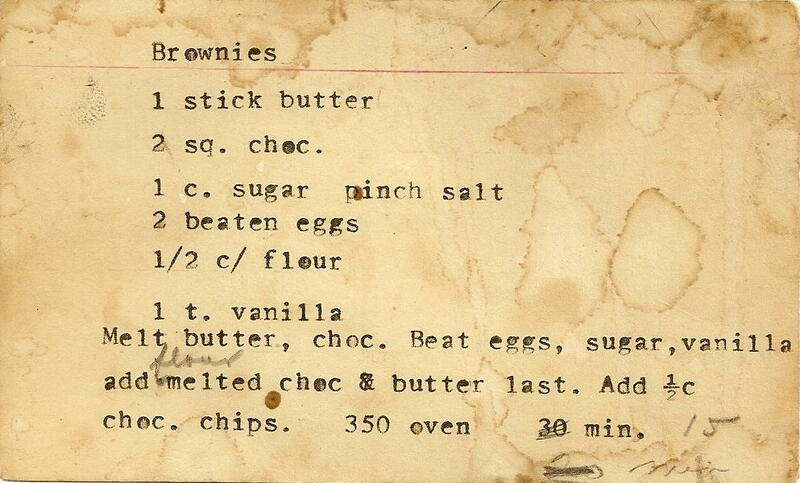 Where or when my grandmother found the recipe, I really cannot say, and this is not exactly as I remember it. Is it my memory or some other factor? Who can say? Nonetheless, it is one I will include in my cannon of brownies – various recipes for different occasions, urges, moods, and seasons – brownies are not one size-fits-all….regardless of your collection of brownie recipes, be it expansive or minimal, I believe this is a worthwhile addition to your own cannon of brownies – with powdered sugar on top, of course. Thanks, Grandma Jessie, for writing this one down! Preheat oven to 350 degrees. Grease an 8” x 8” inch pan, preferably non-stick. 1. Melt butter and chocolate, either in double-boiler, or in the microwave (pretty much all I use mine for, other than heating milk for coffee…) at 75% power, stirring at one minute intervals, until the chocolate is almost entirely melted, but not quite. Let cool for a few minutes until just warm or tepid. 2. Add sugar to chocolate-butter, mixing thoroughly. 3. Incorporate eggs until well-blended, then stir in vanilla, followed by pinch of salt. 5. 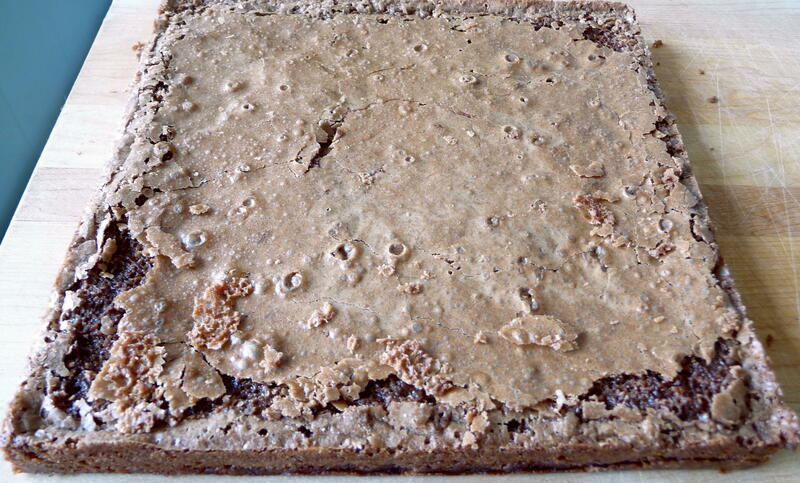 Place brownie pan on lower-middle baking shelf. 6. Bake for 25 minutes, or until the top is pale, mocha colour, and a few wet crumbs stick to tester; the brownies will be very wet. This entry was posted in Baking, Brownies, Dessert, Recipes Misc, What Would Jessie Dish and tagged Brownies, Chocolate, Dessert, Gooey, Squares, WWJD. Bookmark the permalink. 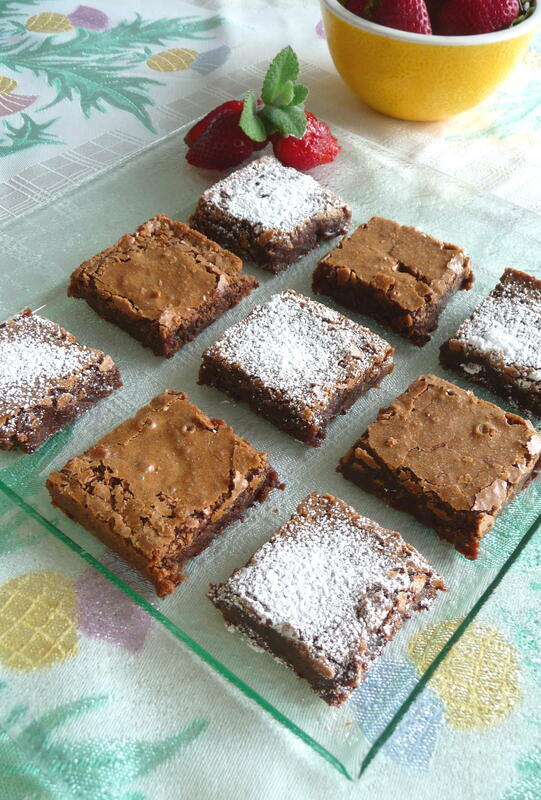 These looks almost like Swedish brownies, and so good and soft and chewy, just the way i like them. The last photo looks wonderful! 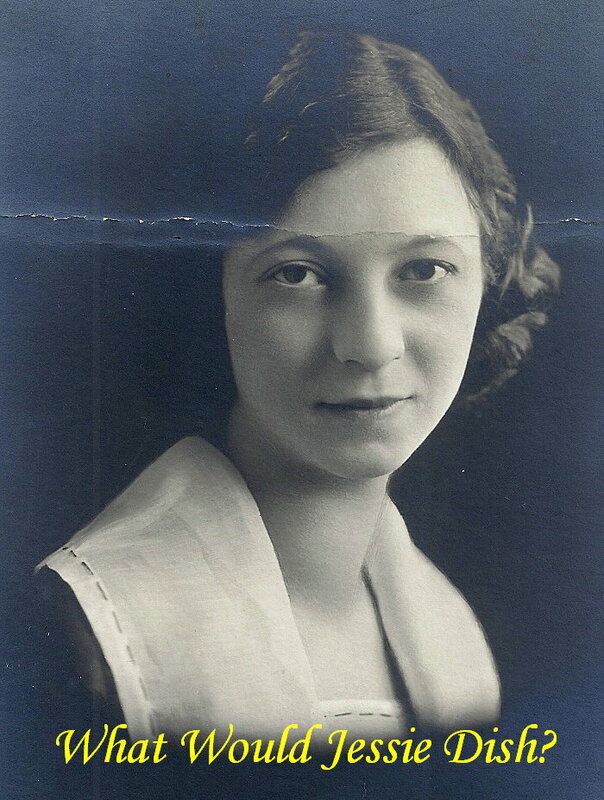 My grandma never wrote down any of her recipes. I wished she did because trying to recreate the flavors of your favorite dishes from your childhood based on your memory can be quite challenging. Thanks, KM. I am trying to improve my foodstyling and photography skills, so I appreciate your kind remark. I find even comparing the actual recipe, when written by the grandmother-cook, to be different from the memories of a dish…quite fascinating. They look awesome – love that sugary crust on top – and how cool that you’re recreating your Nan’s recipes. Love, Love, Love your Blog!!! The recipes look and sound wonderful. Could u use powered cocoa, such as Hershey’s instead of the bars?? ?